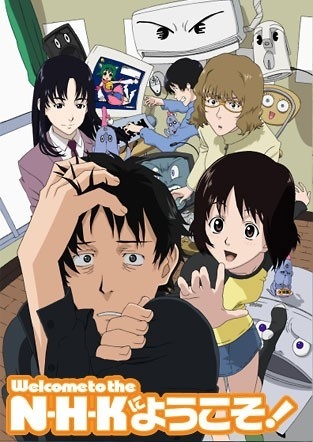 Welcome to the NHK – A More Serious and Sombre Shut-In Story « Geekorner-Geekulture. Tatsuhiro Sato is the protagonist of the show. He’s a 22 year old college dropout and had barely left his room for the past three years, except going to a nearby park at night to smoke. He suffers from social anxiety, depression, and paranoid schizophrenia. He believes his hikikomori state is to be blamed on the NHK (which in real life stands for the Japanese version of the PBS). The show begins with him meeting a girl who tells him she will pull him out of the world of hikikomori, we see him reunite with an underclassman from his old school club who is a full-blown otaku eroge game developer, and he also meets his heavily medicated upperclassman from the same club, who had told him of the conspiracies that surround us everywhere in life. The characters, especially when listed like that, seem completely whacky, especially when you consider that Misaki, the girl who tries to save Sato does so not out of kindness – but out of desire to find a purpose in life. She feels completely worthless, and is actually looking for someone to look down on – in fact, one advice she provides Sato which backfires when he goes out once is “You feel anxiety because you feel you’re worth less than people around you. When you’re around people imagine they’re all inferior to you.” But this is not what the show is about – these characters do not feel like caricatures. They feel like real people, with real insecurities, with real backgrounds, who struggle with the lot life gave them. It is not that life is necessarily tougher for some people from the onset (and sometimes it is, such as when we learn Misaki’s background) – but we do not all deal with things the same way. A statement said towards the ending of the show that originally seemed to strike me as profoundly true was when Sato realized people can be hikikomori because their environment permits it – their parents let them stay and live with them, they get allowances which lets them live as they do, people buy their groceries and/or cook their food. People would be “forced” out of being shut-in if their environment didn’t “enable” them. Then I thought back – I’ve met people, from 22 to 60 years old who spent every day in a mental care facility, and the evenings at home, after falling into depression, psychotic breaks, and other emotional hardships in life. They received a temporary disability stipend from social security for being unable to work. Sure, this still requires you to go out and receive help or be sent there by the people around you. And this brings me to the other point. The “treatment” Misaki provides would probably be categorized as “Exposure Treatment” – forcing someone with a phobia to come face-to-face with that fear. But no one can truly force you, and if they do you might act as a zombie who goes out and “lives” because there is no other choice but to starve, but you go out as an introvert who suffers in social situations and the emotional damage just piles up. From a personal perspective, I also have interest in NEET/Hikokomori stories because I feel close to them – even though I work nearly full time while pursuing my Master’s degree currently, I feel very close to it – the feeling of “Why go out there? It’s such a pain. Life is so hard.” is something I often think and experience. Also, in the final year of high school one of my classmates stopped leaving his home one day, and stopped attending classes. The opening episodes of the series were a bit hellish. I often think of nightmares as revolving around sound, and when we see some of Sato’s hallucinations the music and animation style are fittingly overbearing. Conclusion: I give this show 9/10 human failings. This show isn’t going to tell you an uplifting story about the human spirit, so don’t go in expecting one. You’ll see pyramid schemes, online suicide pacts, and in general human sadness. What you will take out of the show ultimately depends on what you put in, so it might not be fit for all audiences. I am also loathe to suggest it to people who are wont to suffer from depression. Should you watch it, however, I think you will find it time well-spent. This entry was posted in anime, Things I Like and tagged Hikikomori, NEET, Tatsuhiko Takimoto, Welcome to the N.H.K..
Over here on reddit there’s been a long discussion after I reposted this, feel free to go and have a look. Welcome to the NHK can be troubling to watch, due to it’s realism. I also question Misaki’s treatment on Sato’s shut-in “illness”. A phobia in my opinion, is something that needed to be cured in a natural and gradual manner, not through force. When being forced to move out regardless, one’s own mental strength might not be able to sustain the intangible societal damage and it might just gets worse. I agree, though “shock therapy” does seem to be something people do. I used to fear dogs a lot, I still fear them somewhat – people kept telling me “Just come touch the dogs then!” not realizing that’s the last thing I wanted. Or “The dog won’t bite you.” – fear is often irrational, we know this, doesn’t matter. Also, in case it wasn’t clear, Misaki was very clue-less. You can really see this when Sato takes her knowledge of Jung and turns it against her. She read some things on a basic level and went along with it. Naturally, there’s a reason you need more training to treat people. Just finished watching this show and I loved it! Its a real change from the usual stuff I watch and I really hope I find more anime like this one. I especially love how the characters are portrayed, I actually ended up liking them so much to the point that I wanted more. Sadly, anime like this is actually quite rare, with mature treatment of character and situation.